I have started reading Dhammapada in the later part of this year, when I borrowed the book from Madison Library. The treatise Dhammapada is a compilation of Buddha’s teachings during his life time giving instructions to his disciples, advice on meditation, guidelines for moral conduct for monks and householders, cautions and guards against pitfalls in Sadhana, and many other topics on spiritual path and dhar(m)a for a seeker after truth. Buddha is an embodiment of renunciation and compassion and he pointed out the Path of Morality (Sila), Concentration or Meditation (Samadhi) and true wisdom or Insight (Panna) for attaining freedom from Samsara. The Dhammapada encapsulates all these three topics in-depth and provides a guiding light for an aspirant. Namaste. We wish you all a very joyous and spiritually uplifting Sivaratri. May Lord Siva bless us with Knowledge and Wisdom of the Self. There is SriSaila Linga Satakan written by Srimati Bellamkonda Kanakamma garu in Telugu in praise of Srisaila Mallikarjuna in Srisailam. Divine Ambrosia Winter Issue ! We are pleased to publish the Winter issue of the spiritual E-Magazine “Divine Ambrosia”. You will find interesting and insightful articles in this issue in addition to a light-hearted fun corner. Please feel free to leave a comment with your feedback about this magazine. If you want to contribute articles for the next spring issue (due in May 2013), please let us know through email. Our Endeavor to Go Vegan…. Last year when Hari & I visited University of Wisconsin-Madison to browse through their library, we picked a newsletter on the way. 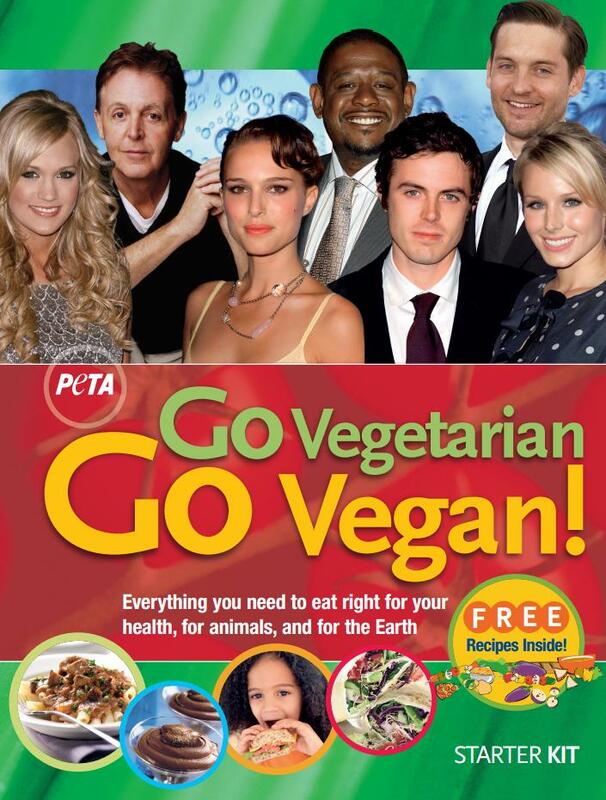 It is titled “Go Vegetarian, Go Vegan” published by PETA (People for the Ethical Treatment of Animals). This newsletter highlighted the cruel treatment of cows, pigs, hens, chicken – which form the bulk of meat industry – here in US at the merciless hands of the butchers and money-oriented food industries. Consumers are interested only in consuming the end-product which is some chunk of meat wrapped air-tight neatly in some container and frozen, and are not giving even an iota of thought of the violation of life behind it. If only we pay attention to the means and the process behind the scenes that results in the end product, it would be very heart-wrenching and the food could not be even looked at without feeling a sense of sadness. This whole meat-producing industry survives by a mindless and irresponsible consumption. Unless and until we consumers pay attention to what food goes in to our mouths, what has been sacrificed or compromised to result in the food, the food that we eat cannot bring us health and happiness. Violation of life is in itself an antagonist to whole well-being. We wish all of you a very Happy, Prosperous, Transformative, Innovative, Creative, Peaceful New Year 2013. All the best for all your endeavors. As the year 2013 is approaching, I am trying to think in, out and through the “Black Box”. A question that has occupied my mind for a long time – at least since a decade – when I captured the question in my mind in the following picture (in the year 2003). Life is filled with race – for money, luxury, comfort, security, fame, name, recognition, success etc – all the “so-called” ingredients for a happy life. Most of the humanity seems to be in search of something exquisite, which it fails to comprehend, but engages itself in a race for the above things in the hope that it can achieve that exquisite goal. The above things give security and freedom, I am sure, but do they give unperturbed happiness, peace, contentment? Divine Armor of Protection ! This post has been on my mind for quite a while. It is a very painful paradox that on one hand, societies and communities all over the world celebrate Women’s divinity, strength, beauty and wisdom, but on the other hand, women are assaulted, brutally raped, physically and emotionally abused. I have noted these atrocities in the history leaves of every society in every country. We can measure the depth of percolation of the value system in a society by looking at how the society treats Women, Children, and Prisoners Of War (POW), and it does not paint a pretty picture. Every society is failing and falling apart in this basic moral system. Women are being looked down as objects of enjoyment and pleasure, more so in some sections of society laden with poverty, alcohol, drugs and struggle of survival. No matter the color, race, age, education factors, women are violated, abused, humiliated and their freedom mishandled. There is always apprehension for the physical safety of daughters and sisters. Newspapers all over the world are abound with such news of violation of Women’s honor. What a despicable condition !